Thursday 25 April 2019 05:48 | WorldAntique.net in 2 countries | 69 antique dealers present: 140,864 antiques with photo. 9 conservator, 4 antique fairs, 4 associations. 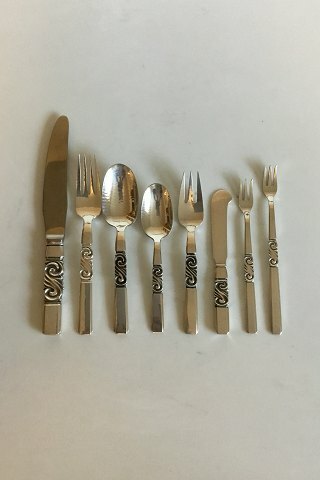 Georg Jensen Sterling Silver ScollFlatware set for 12 persons, 96 pieces. Georg Jensen Sterling Silver Scoll Flatware set for 12 persons, 96 pieces. 12 x Dinner Knifes, 22.5 cm / 8 55/64 in. 12 x Dinner Forks, 17.9 cm /7 3/64 in. 12 x Dinner Spoons, 17 cm / 6 11/16 in. 12 x Child Spoons, 14.9 cm / 5 55/64 in. 12 x Salad Forks/Fish Forks, 16.2 cm / 6 3/8 in. 12 x Butter Knifes, 14.5 cm / 5 45/64 in. 6 x short Lubster Forks, 15.3 cm / 6 1/32 in. 6 x long Lubster Forks, 16.9 cm / 6 21/32 in.